diverse range of workstyles to drive their business in this fast-paced mobile age. deliver flexible and diverse workstyles for increasingly mobile businesses. screen touch panel uses easy-to-understand icons and colors for an intuitive user interface. operations in a time-efficient manner. 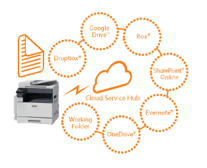 check scanned documents and share data among remote locations. image reproduction with precision and less color misregistration. work processes with no need for computer access. scanning, which sends scanned data to any computers connected to the device. 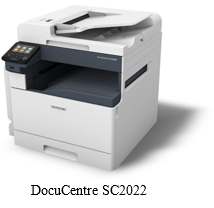 reduces waste by eliminating accidental or unnecessary printing. required to obtain connectivity to cloud services. “Wireless LAN Kit” and “USB Memory Kit” are optional products. Note 4: NFC stands for Near Field Communication. are registered trademarks or trademarks of Xerox Corporation in Japan and/or other countries.